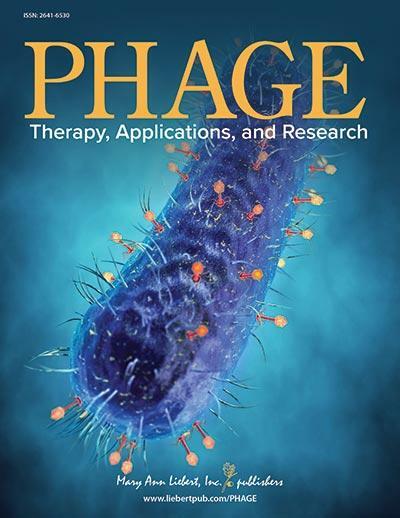 Mary Ann Liebert, Inc., publishers announces the launch of PHAGE: Therapy, Applications, and Research, the only peer-reviewed publication dedicated to the burgeoning field of bacteriophage research and its applications in medicine, agriculture, aquaculture, veterinary applications, animal production, food safety, and food production. Spearheaded by Editor-in-Chief, Martha Clokie, PhD, Professor of Microbiology, University of Leicester, UK, PHAGE will be published quarterly online and in print and will serve as the cornerstone publication of phage research with the goal of solidifying, growing, and unifying its emerging community of innovative researchers and clinicians. A preview issue of the Journal is planned for summer 2019. Topics covered in PHAGE will include: Life cycle of phages; capsid structure and morphology; genome organization and content; phage transcriptional takeover and regulation; roles of phages in natural ecosystems; impacts of phages on bacterial/eukaryotic physiology; immune cell modulation by phages; multidrug and antibiotic resistance; regulation of gut microbiota and GI infections; regulation of lung/skin/bladder/blood/bone and other infections; application of phages post-surgery; genetic engineering of phages; roles of synthetic phages to manipulate inflammation and cancer; impact and exploitation of CRISPR-Cas systems; phages as vectors for gene delivery; vaccine development; phage based diagnostics; phage proteins and enzymes; bacteriophage lysins; phage therapy in plants; phage therapy in aquaculture and fisheries; phages and food production and safety; nanotechnology and materials science; drug, gene, and antibody delivery; novel model systems to study phage behavior; clinical and animal trials; phage therapy ethical and regulatory challenges; and phage therapy policy. For complete information, to sign up for email alerts, or to submit your manuscript, please visit the PHAGE website.